Spotted on a street in our local town. 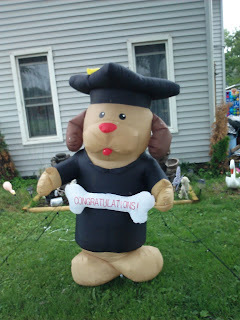 Note the bone, aka scroll, says "Congratulations". We're a bit past graduation time now but I'm always fascinated by how obsessed Americans are with the concept. A lady in my exercise class this morning bemoaned the fact that she'd been travelling and missed her granddaughter's graduation. I wanted to say that she looked far too young to have a granddaughter at university but before I got the chance, she added "from Pre-K". That's nursery school to you and me. Yes, America has a graduation ceremony from nursery school, where the kids wear cardboard mortar boards and presumably march in to "Land of Hope and Glory" as they do for the more grown-up ones, which include graduation from Elementary School, which is called Eighth Grade Graduation and of course High School. I don't know why they use "Land of Hope and Glory" (minus the words) for graduation ceremonies but they do. Another reason why the Last Night of the Proms would mean something totally different this side of the pond. By the time they get to graduate from university, they must be sick of the sound of it and have enough scrolls to paper the walls. I suppose it all adds to a sense of achievement and oodles of that quality du jour, "self-esteem". And a chance for parents and teachers to say "Good job!" Which is American for "Well done" and is all too frequently heard in the presence of small children managing to do very ordinary things. Still, I bet they looked sweet.